Gazpacho is a cold Spanish tomato-based raw vegetable soup, originating in the southern region of Andalusia. Gazpacho is widely consumed throughout Spain, neighboring Portugal (where it is known as gaspacho) and parts of Latin America. 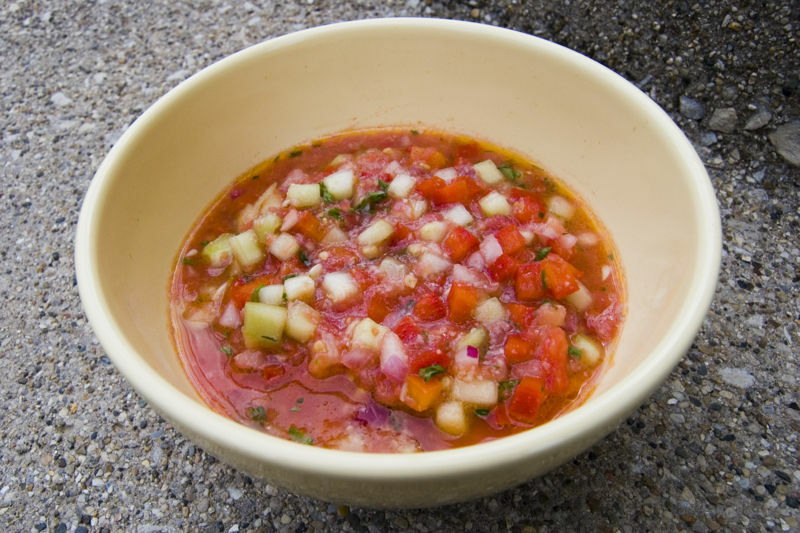 Gazpacho is mostly consumed during the summer months, due to its refreshing qualities. Left: Gazpacho with blended ingredients. Gazpacho has ancient roots. There are a number of theories of its origin, including as an Arab soup of bread, olive oil, water and garlic that arrived in Spain with the Moors, or via the Romans with the addition of vinegar. Tomato was added to the recipe after it was brought to Europe after the Columbian Exchange which began in 1492. The dish remained popular with field hands as a way to cool off during the summer and to use available ingredients such as fresh vegetables and stale bread. 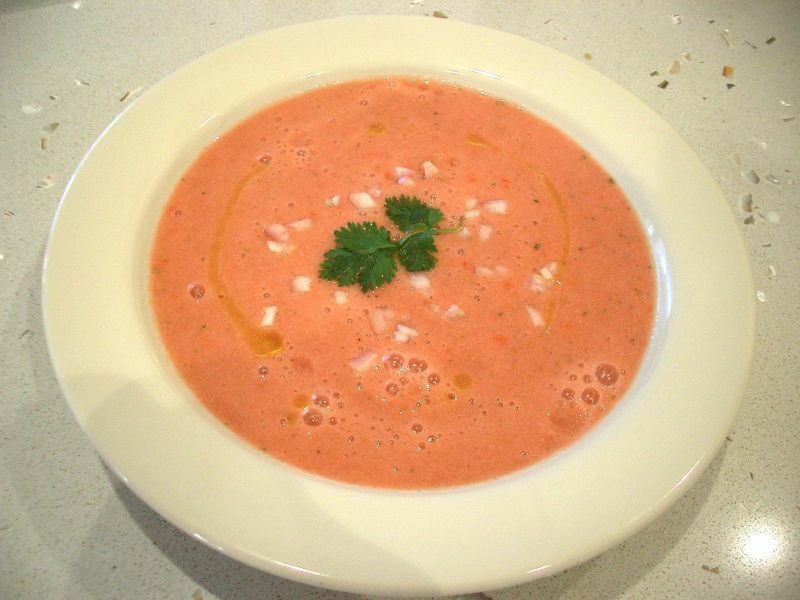 There are many modern variations of gazpacho, often in different colors and omitting the tomatoes and bread in favor of avocados, cucumbers, parsley, watermelon, grapes, meat stock, seafood, and other ingredients. Gazpacho has become an almost generic term for chilled vegetable soup. Left: Gazpacho with diced ingredients. In Andalusia, most gazpacho recipes typically include hard bread, tomato, cucumber, bell pepper, garlic, olive oil, vinegar of wine, and salt. Some may also include onion. The vegetables are washed and the tomatoes, garlic and onions are peeled. All the vegetables and herbs are chopped and put into a large container (alternately, the tomatoes may be puréed in a blender or food processor, pounded with a mortar or strained and de-seeded with a food mill). The soaked bread is then added (optionally). Some of the contents of the container are then blended until liquid, depending on the desired consistency. Chilled water, olive oil, vinegar and salt is then added to taste. Garnishes may be made with fresh bell pepper slices, diced tomatoes, or other fresh ingredients. Traditionally gazpacho is made by pounding the vegetables using a mortar and pestle. This method is still sometimes favoured as it helps keep the gazpacho cool and avoids the completely smooth consistency, and foam, created by blenders and food processors. 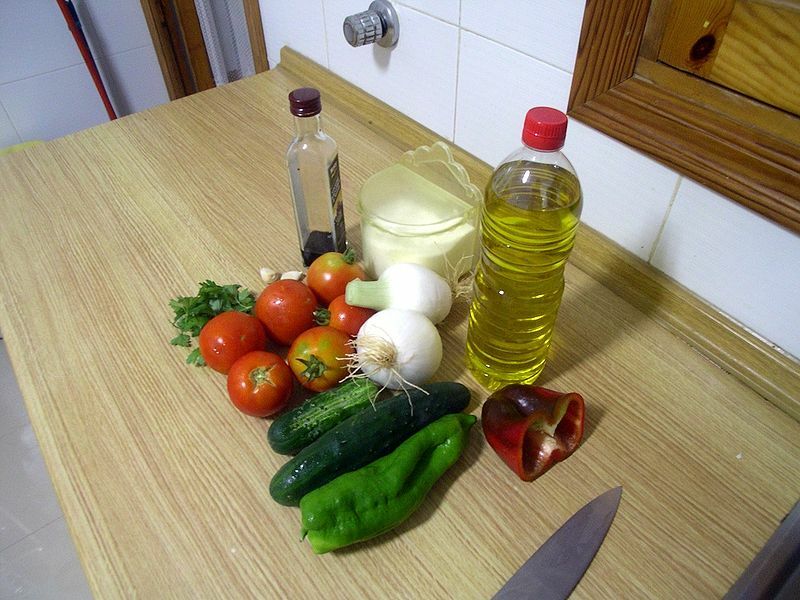 Left: Typical ingredients for gazpacho. In addition to the blended vegetable ingredients, it is also usually accompanied by different garnishes. These include the same vegetables the soup already contains, chopped up, as well as croutons. The garnishes are served separately so the consumer can add them to the soup themselves. When making the salmorejo variety from Cordoba, chopped hard boiled egg and ham (e.g. jamón serrano, jamón ibérico, etc.) will be placed on top. In Extremadura, gazpacho with local ham is called gazpacho extremeño. This time, the ham tends to be added to the soup in the kitchen prior to serving (unlike the other garnishes which are added at the table). Gazpacho may also be served with ice cubes if it has not had enough time to chill before serving.